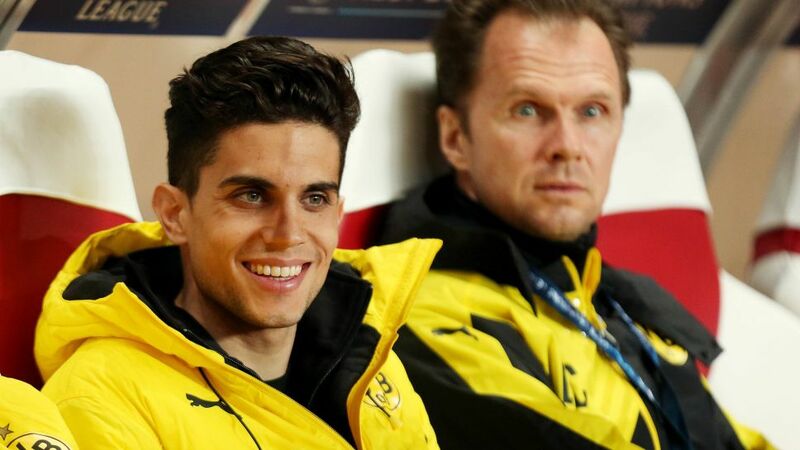 Borussia Dortmund flew injured centre-back Marc Bartra to Monaco for Wednesday's UEFA Champions League quarter-final second leg against AS Monaco. The 26-year-old suffered a fractured wrist in the bomb attack on Dortmund's team bus last Tuesday evening, as the players were travelling to the SIGNAL IDUNA PARK for their first-leg meeting with the French side. The Spaniard is set for four weeks on the sidelines after undergoing surgery last week. On Wednesday the club made the decision to fly him to Monaco, where he had a front-row seat of his side's 3-1 defeat at the Stade Louis II. Bartra was even among his teammates in the dressing room ahead of the game, having hoped to inspire them to overturn a 3-2 deficit from last week. The Dortmund players paid tribute to Bartra after their 3-1 win over Eintracht Frankfurt in the Bundesliga on Saturday, with Sokratis Papastathopoulos dedicating his stunning goal to his fellow centre-back. Bartra also had a couple of surprise visitors this week, in the shape of former FC Barcelona teammates Jordi Alba and Sergio Busquets.